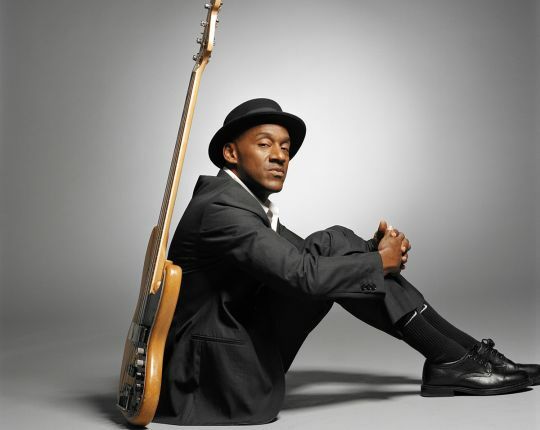 Marcus Miller is an American jazz multi-instrumentalist, composer, producer, arranger and two-time Grammy winner. The world-known bass guitarist also plays keyboard and bass clarinet at his performances. His name has topped the critic and reader surveys for three decades. As a sideman, he took part in recording around 500 albums across a range of musical styles: rock (Donald Fagen, Eric Clapton), jazz (George Benson, Dizzy Gillespie, Joe Sample, Wayne Shorter, Grover Washington, Jr., David Sanborn), pop (Roberta Flack, Paul Simon, Mariah Carey), R&B (Aretha Franklin, Chaka Khan), hip-hop (Jay-Z, Snoop Dogg), blues (ZZ Hill), and more. As a producer, composer and performer he was one of the last musicians who worked with the legendary Miles Davis. Marcus wrote and produced Tutu album which has been a huge worldwide success. He also wrote music to the iconic Siesta movie which was performed by Miles Davis. Now Marcus has a new CD Laid Black just released on June 1st and obviously he will present some of his new compositions in Lviv.